There are a lot of moving parts in this story. The rising use of opioids and all the other predisposing factors that culminate in homelessness combined with the hollowing-out of the middle-class/economic stratification seen in boom cities, San Francisco, London, Seattle et al combined with local policy/politics which in Seattle means the spendthrift city council juxtaposed with Amazon's strategy of not having taxable income and Chairman Bezos' spearheading the fight against the Washington state 2010 personal income tax measure along with house price increases that guarantee a permanent underclass that will never get on the first rung of the inter-generational wealth building ladder, which price increases are caused in great part by city and regional policy against "sprawl" and well, it's complicated. Another week, another piece of “tech-lash”. Facebook has been in the cross hairs for its (mis-)handling of consumer data. Now, Amazon has become embroiled in a separate tussle about tax and inequality in Seattle. While the sums involved are tiny, investors should take note — if nothing else because the Seattle saga captures the wider challenges being created by the stunning success of tech today. The issue at stake is a new tax that the city of Seattle is introducing to tackle homelessness. The council had initially proposed asking each local company with more than $20m revenues to pay $500 tax per employee. However, Seattle-based businesses like Starbucks and Amazon complained. Indeed, the latter company was so angry that it halted a downtown expansion in protest. So this week the city cut the tax to $275 a head, hoping to raise $45m or so. At this point, you might stop reading. After all, $45m is a piddling sum for a company such as Amazon, which employs 40,000 people in the Seattle area and just notched up $1.6bn quarterly net earnings. Meanwhile, everybody agrees homelessness is now a dire problem in the city, fuelled by opioid addiction. Thousands of homeless people live in grubby, trash-strewn encampments, many close to Amazon’s offices. Moreover, the city has limited ways to raise revenue, since the state bans income and wealth taxes. But Jeff Bezos, the Amazon chief executive, is still seething. This week, an executive declared that the company is “disappointed” by the new tax and “very apprehensive about the future created by the council’s hostile approach and rhetoric toward larger businesses, which forces us to question our growth here.” In plain English, it is threatening to leave. 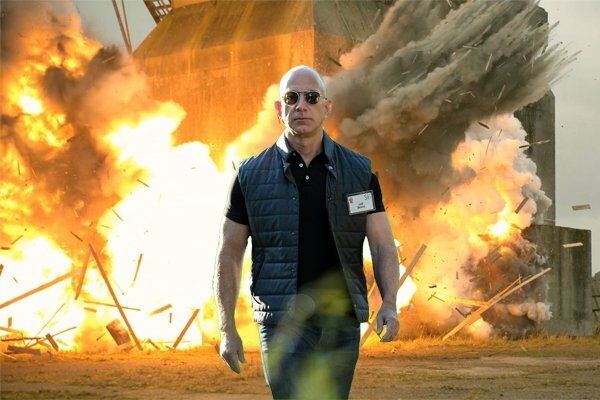 Ms. Tett goes on to list three lessons to be extracted from this mess while her commenters bring up a quaint old term that may keep the mobs at bay, at least until the Bezos Rocket Co., Blue Origin, is ready to whisk Mr. B away from the mundane. The question that keeps coming to mind is: "Will the 'techlash' crimp the reach of the platform companies?" Even for Facebook it's an open question whether all the hubbub isn't just Macbeth's comment on life itself, writ small: "full of sound and fury, Signifying nothing." "Seattle considers raising rates for Uber and Lyft rides to boost driver compensation"
Well this doesn't fit Uber's business plan at all. But if it comes to pass, Seattle is probably the place for raising rates. First off and most importantly, with the giant engine of Amazon funneling money from around the world into the city, there is more room for elasticity in both wages and costs. "Is Amazon Too Big to Tax? The e-commerce giant paid zero federal taxes in 2017..."